The Wayzata boy’s hockey team moved to an undefeated 4-0 this week with victories over two high-ranked teams this past week, Centennial and Duluth East. 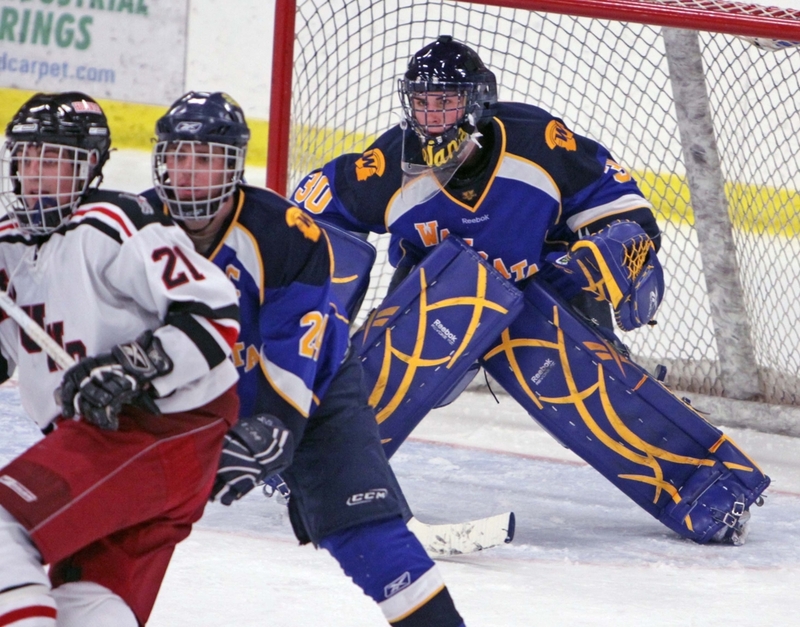 On Thursday, December 3rd, Wayzata hosted 8th ranked Centennial and sent them home with a 4-2 loss. The following Saturday Wayzata squeaked out a 4-3 OT victory over top-10 ranked Duluth East in a Heritage Center in Duluth. Wayzata began the week was 9th and 11th by various AA state rankings. However, they look to move up in the rankings with these key victories. Wayzata jumped out to an early lead with a power play goal by sophomore forward Mario Lucia at 7:44 of the first period (assists: Tony Cameranesi, Seth Barnes). Defenseman Lucas Whalen sniped a shot past Centennial net minder Brett Larson at near the close of the period (assist: Lucia) to give Wayzata 2-0 lead. Jared Brunn of Centennial scored the lone goal of the second period on a power play at 12:41 (assist: Riley Colvard). The teams went to the locker room with Wayzata up 2-1. Whalen netted his second goal of the game at 4:33 of the third period to put Wayzata up 3-1 (assists: DannyWalsh, Tanner Jensen). Scott Holm put the game out of reach with an unassisted goal at 14:56 of the third. Jordan Lovick scored an unassisted goal for Centennial at 15:35 to make the final 4-2. Wayzata junior goaltender Andrew McIntyre was awarded the victory. Winning teams find a way to get it done, and that’s just what Wayzata did in this classic battle against Duluth East at the Heritage Center in Duluth. Wayzata fell behind early after Duluth East’s Kenny Mellin scored on a powerplay at just 1:17 into the first period (assists: Andy Welinski, Jake Randolph). Wayzata regrouped and Lucia tied the score with a goal at 5:11 in the first period (assist: Miles Death). Wayzata took the lead at 4:14 of the second period with an unassisted goal by senior Scott Holm. And while Duluth East out shot Wayzata 14 – 9 during the second period, goaltender Alex Clayton shut down several Duluth East scoring chances and the period ended with Wayzata ahead 2-1. Duluth East came roaring back in the third period with two goals in eight seconds. Randolph scored his second of the game at 3:48 (assists: Phil Johnson, Mellin) followed by Nolan Meyer (assist: Luke Renier). Wayzata struggled through the period, being outshot 15-8, until Lucia set-up a break-away with a perfect half-rink pass to junior Tyler Klein as he exited the penalty box at 13:27 of the 3rd period. The game ended in a 3-3 tie. Overtime play was more even, with shots at 3 apiece. After killing a penalty, Wayzata defenseman Death’s blast from the point at 4:53 sent the Trojans home with a victory (assists: Cameransi, DJ Jones). Clayton made 37 saves for the Trojans.